Let this informative article by the ham experts educate you about the different types of ham, how to prepare them, and great side dishes to make your Easter dinner fabulous. Ham is a tradition on Easter menus with good cause: It's lean, hassle-free and has that unique, sweet-smoky flavor everyone loves. This year, create a new tradition by complementing the taste of ham with a contemporary "take" on tradition. "Create salsas and chutneys that pair happily with ham," says Ceci Snyder, M.S., R.D., Director of Nutrition Communications for the Pork Information Bureau for the National Pork Producers Council. 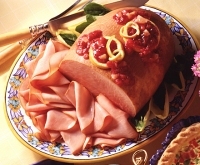 Snyder recommends selecting two or three toppings to complement the Easter ham buffet, like Cranberry-Jalapeno Chutney, which combines sweet and spicy tastes and Pineapple Salsa, which packs the sweet, zesty and tangy flavors of orange marmalade, cilantro and pineapple into one sauce. While planning the holiday menu, Snyder recommends consumers acquaint themselves with package labeling to ensure they select the best ham for the occasion. The USDA requires hams to be labeled indicating the amount of curing ingredients added to the ham. Curing is a simple process of preserving meat -- hams are either dry cured with salt and spices rubbed into the meat's surface, or wet cured with a brine solution. Most hams are then smoked and fully cooked. Ham -- No water is added to this ham, as it is dry cured, "old-fashioned," "country-style" or "southern-style" ham. This ham is a southern specialty, extremely salty and is usually served in small portions very thinly sliced. Ham with Natural Juices -- This ham has little water added in the curing process, and is often the favorite choice for a dinner centerpiece. It's favored because of its velvety texture and attractive appearance. Ham -- Added Water -- These hams retain more water during the curing process than "ham with natural juices." These hams have extensive menu versatility and are ideal for steaks, thin slicing and shaving. Ham and Water Product -- This ham product has the most water added, diluting its protein and fat content, as well as its price. A good choice for sandwiches, this ham is commonly found in the deli and is excellent for slicing or shaving. v Most hams on the market today are fully cooked, and will be labeled so. Fully cooked hams can be served without heating, if desired, right from the refrigerator. To serve hot, simply unwrap, heat to an internal temperature of 140 degrees F. and serve. Just follow the directions on the label and heat in a moderate (325 - 350 degrees F.) oven. A ham labeled "cook before eating" should be roasted to an internal temperature of 160 degrees F. Plan on cooking an uncooked ham for 30 minutes per pound, and use a meat thermometer to judge doneness. As with any perishable products, refrigerate leftovers within two hours of serving. Traditional Easter Dinner - Looking for a great and easy traditional Easter menu? Here are our favorite tried and true Easter recipes. Easy Easter Table Decorating Ideas - Quick, easy, and inexpensive ideas for centerpieces, decorations, flowers, projects, and place cards. Elegant Easter Menu - This menu is elegant...but not super fussy or hard to make. If you are looking for a nice change from your typical Easter menu, or even just want one different dish to serve, check out these recipes. Bugs Bunny and Friends Easter Feast Menu - Need something cute and fun for the kids? Try this great menu! Jazzing Up Your Holiday Ham - Try these simple and easy recipes to add some interest and flavor to your Easter ham. Ease Into Easter - Want some dishes you can make ahead of time so you can have a nice peaceful Easter Sunday? Then check out this menu and selection of recipes that can be made in advance. Article and photos courtesy the National Pork Product Council.